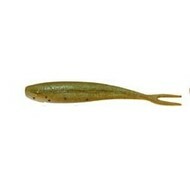 Gulp Power minnow Check any bream tournament leader board and you are sure to find Gulp! Power Minnows right up there. The reason is simple, they work! Once an angler masters the flicking, jerking retrieve that imitates a wounded baitfish the Power Minnow is deadly on any predatory species. Can be fished effectively throughout the water column from shallow finesse work through to working the bottom using the appropriate Nitro Bream Pro or Jungle Hook jigheads. Add Gulp! scent and flavour to this winning recipe and you have a definite must have for any soft plastic tackle kit. Available in a 3 and 4 inch variations and a multitude of colours.